The chemistry of steelmaking. Home page. 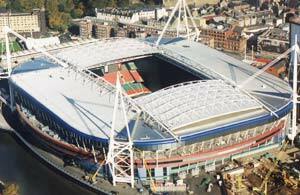 The vast shell of the Millennium Stadium in Cardiff is made from about 12 000 tonnes of steel. This is one example of the many ways in which we use steel in the construction industry. Steel is the most useful of metals. There is a huge number of different jobs at home, at school and in the workplace for which we use steel. Its uses are everywhere, though they often go unnoticed. In this e_source, you will learn more about the part that steel plays in our daily lives and about the methods we use to manufacture it. A glossary of terms: any word with a glossary entry is highlighted like that. Clicking on the word will open a new window with a definition of that word. Quick questions: at the end of each page is a quick question to test your understanding of that page. Type in your own answer then click on the button to show the answer that experts would give. Roll over diagrams: many of the diagrams have highlights or sequences. You can see these by rolling your cursor over part of the picture or part of the text. The text has a roll over highlight like that. The earlier version, called Making Steel, was published in the early 1990s as a booklet and proved very popular with schools. Since then, British schools and British Steel have moved on. The impact of Information and Communications Technology is transforming the way students are learning. In keeping with this trend, we are publishing the latest edition, called The chemistry of steelmaking, as an electronic resource, or e_source, making use of the latest internet technology. In 1999 British Steel merged with the Dutch steel and aluminium producer Koninklijke Hoogovens to form an exciting new force in metals called Corus. The new group will rise to the challenge of todays global markets, serving the market needs for aluminium, carbon steel and stainless steel. One of the aims of Coruss education programme is to enhance the work related curriculum and enrich classroom activity. Like all its educational resources, The Chemistry of Steelmaking has been produced in partnership with schools, colleges and teachers. In this way Corus ensures that our resources are directly relevant to the needs of all UK schools. We hope you will find this e_source useful in your studies and informative about steel, one of the basic elements of every industrial society. We welcome your comments and suggestions on schoolscience.